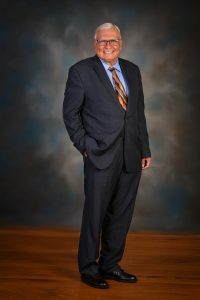 Larry Solomon has served as Mayor for the City of Union since 2014. Solomon became interested in local government when he served as the president of the Hampshire Home Owners Association. He began attending city meetings after his election to the HOA, to see how city decisions impacted neighborhood development. After about two years of attending meetings, he felt that he had a better understanding of what the community was looking for from its elected officials and wanted to see how he could serve the City as a whole. He then decided to run for mayor and won the election in 2014. Solomon was raised in Northeast Ohio, near Columbus. He attended Kent State (Ohio), earning a bachelor’s degree in Political Science. Solomon served in the Naval reserves for a couple of years after college, then returned to school, graduating from Ohio State University with a master’s degree in Public Administration and Business Administration. Solomon began his career in marketing at Kimberly Clark, then went on to work at P&G a few years later. While at P&G, Solomon worked on brand campaigns for such products as Pepto-Bismol, Chloraseptic and Always feminine care items. Solomon eventually left P&G for the opportunity to start the marketing research team at Valvoline Oil. While at Valvoline, he helped produce and develop the product Valvoline MaxLife – an oil for higher mileage vehicles. After 23 years at Valvoline and many projects later, Solomon retired in 2006. Solomon jokes that his favorite thing about being mayor is cutting ribbons and kissing babies, but knows doing the job of Mayor requires much more than chapstick and a pair of scissors. Solomon feels his focus group moderating skills, acquired from his years in the marketing and product promotion business, are a key asset to him as Mayor. The skills he developed by listening unbiasedly to what the people’s needs are, then providing them answers to act on and make decisions are something he uses every day in his role as mayor. Solomon is proud of the progress that is being made in the city during his time as Mayor so far. Several projects he noted are the new Kroger store, growth of several new business enterprises in the city, and the major improvements for Mt. Zion Road. Senator John Schickel, State Representative Sal Santoro, Judge Executive Gary Moore, County Commissioner Cathy Flaig, and Mayor Larry Solomon all went down to Frankfort to meet with Governor Matt Bevin and made unison pitch to complete the road project and execute a plan for building business for the new Union town center that will revolve around the road. He is most proud of the new staffing organization recently put together to run the city: Melissa Hinkle, David Plummer, Donna Wahoff, and Christy Everman all hired as permanent staff to provide leadership for the day-to-day operations of the city. “One of the most important things I am doing as mayor, is assisting and trusting our staff to make better and more informed decisions within a reasonable time,” Solomon said. Solomon has been married to his wife, and best friend, Judy for 41 years and they have a daughter together named Jamie. In his off time as mayor, he enjoys traveling. His favorite place he has traveled so far is Greece and the surrounding islands, but he would like to eventually spend some time driving and exploring Europe. 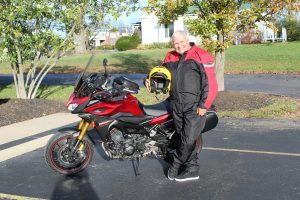 In addition to travel, Solomon also enjoys riding his motorcycle, playing golf, eating seafood and steak, and listening to classic rock.